The Iowa returned to San Pedro on 06/02/2012 after a 65-year absence. 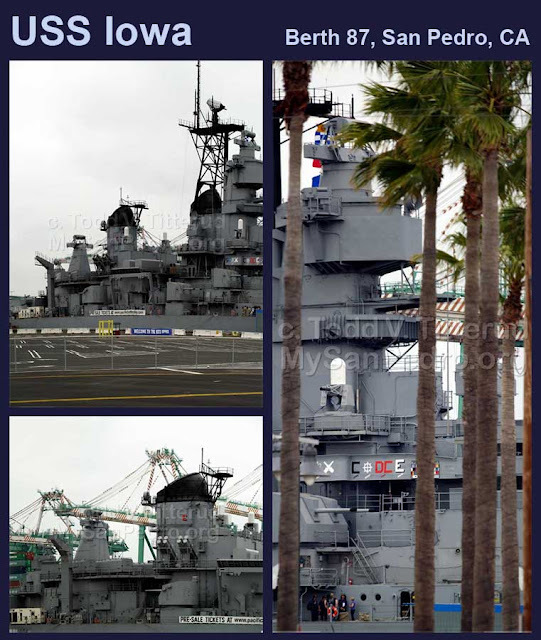 She operated out of in San Pedro Bay from October 1946 to January 1947 during West Coast training exercises and returned on 03/25/1947 for additional training duty (after serving as flagship for the 5th Fleet in Tokyo Bay and before her overhaul at the Puget Sound Navy Yard in October 1947). The Iowa arrived outside the bay on 05/30/2012 and anchored offshore for a bottom scrubbing (to remove potentially invasive species and contaminants) before entering the harbor at Angel’s Gate on 06/02/2012. The Iowa then docked for a week at Berths 51-52 off Miner Street in the outer harbor before the final 3.4 nautical mile journey to Berth 87 on 06/09/2012 (see Los Angeles Times, 06/09/2012; About.com, 06/12/2012; Press-Telegram, 05/30/2012; KTLA.com, 06/09/2012; NBC Southern California, 06/10/2012; Daily News, 06/09/2012; Daily Breeze, 06/02/2012). POLA blocked access to anywhere near the ship while it was in the outer harbor. Miner Street and the Cabrillo Way Marina parking lot were closed. Guards claimed they turned away up to 2,000 visitors an hour on the first morning. From the public walkways of the marina the ship was just visible peeking through the new palm trees on Miner Street and between the masts of sailboats. The following panoramic images were taken at the Cabrillo Way Marina on the morning the USS Iowa arrived in San Pedro. Click on the images to see larger versions of them (control/right-click to see them in a separate tab). The following panoramas were taken from Crescent Street and the walkway just above the new 22nd Street Park on the morning of June 9, 2012 before the Iowa’s final passage down the Main Channel to Berth 87. The Iowa was barely visible on the horizon to the right of Warehouse 1 until I zoomed in on it with a telephoto lens. The Iowa was even less visible from Cabrillo Beach where the early morning crowd of weekend windsurfers, stand up paddle surfers, and kayakers [Note: The first kayakers arrived in San Pedro from Russian America about 200 years ago to poach otter skins] were just entering the waters on both sides of the breakwater. The towers of the Iowa appeared landlocked between the SS Lane Victory and Warehouse 1. The Iowa was more visible from the Cabrillo Marina [the former site of lower Fort MacArthur and the Navy landing area when the Pacific Battle Fleet was based in San Pedro] where yachters, sail boaters, and onlookers paused for a Kodak moment or just to gazed at her profile. 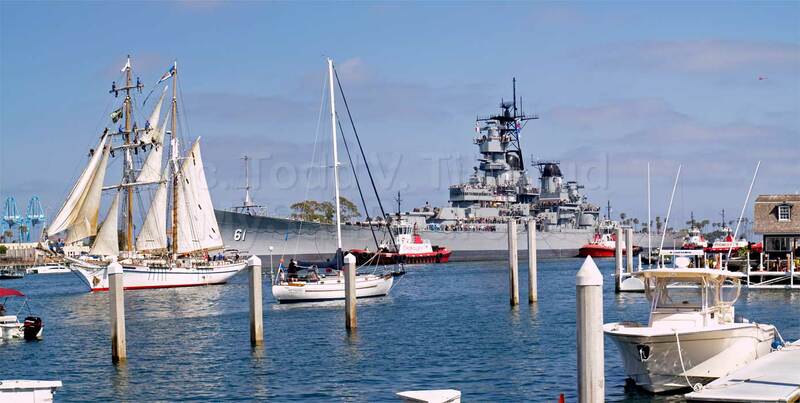 After the morning’s June Gloom dissipated it became a classically beautiful San Pedro day—perfect for the welcoming parade down the Main Channel. The channel lookout next to Warehouse 1, where generations have watched ships enter and leave the harbor (a new mini pier was recently added as part of the waterfront redevelopment project), was filled hours before the parade but the new walkway and small park at the south end of Ports O’ Call (next to the Jankovich & Sons fuel station) was also a good viewing site. The area used to be filled with tourist shops as part of Whaler’s Wharf (where the New England style buildings were used as a filming location for decades, posing as Maine or Massachusetts for television and the movies). 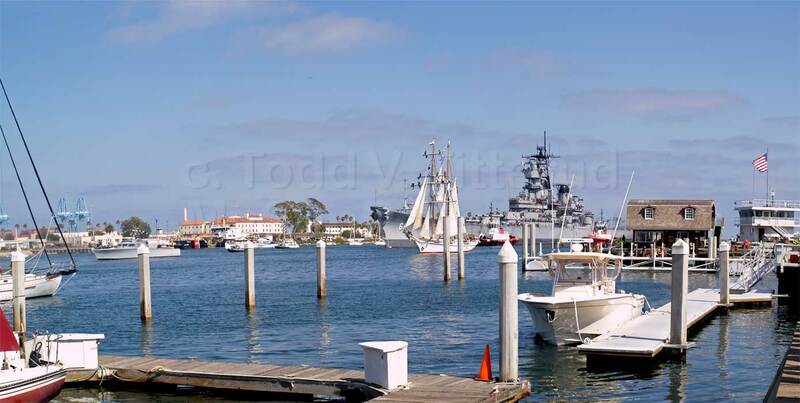 The Iowa’s arrival was heralded by harbor patrol boats, fireboats spouting their traditional and popular display of water power (San Pedro’s original fanfare fountain was the old Fireboat No. 2 which is still on blocks in the parking lot between the Iowa’s new home and Fire Station 112, awaiting construction of its museum and the new downtown harbor), LA’s official tall ships (the Irving Johnson and Exy Johnson of the LA Maritime Institute), and the P-520—an 85-foot restored WWII crash rescue boat (see also WB-LB). On both sides of the channel a constant flow of yachts, sailboats, and motorboats (including the harbor and Catalina cruises) watched the parade from the water while adding to the show for the landlocked. 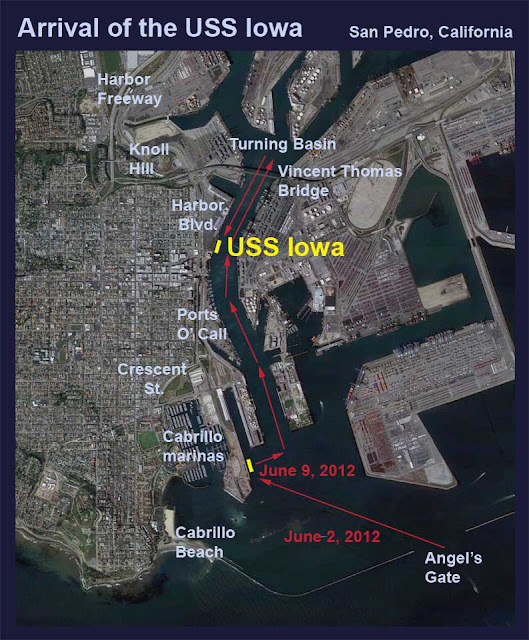 The USS Iowa traversed the length of the Main Channel, slipped under the Vincent Thomas Bridge, rotated in the Turning Basin, and then docked at Berth 87 (once used for giant RORO auto carriers from Japan and more recently as a spare cruise ship dock). From Knoll Hill the antennas and tips of the Iowa’s towers could be seen peaking above the trees and freeway signs as it moved down the channel until emerging and rotating within the gap between the bridge and the stacks of containers at China Shipping. 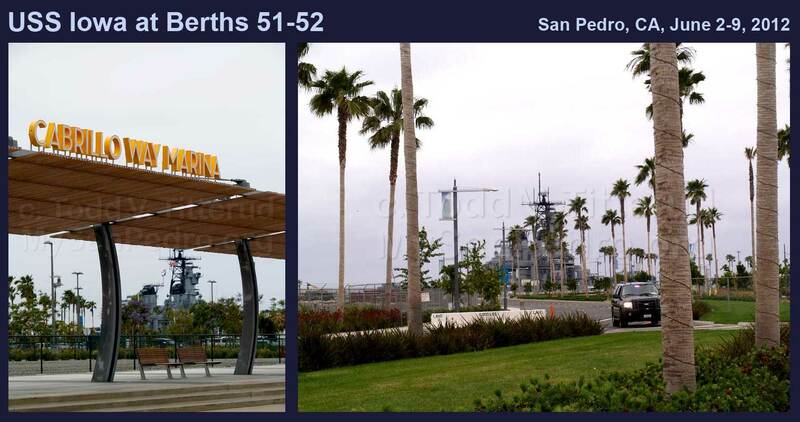 The following panoramas showing the USS Iowa in her new home at Berth 87 were taken from Harbor Blvd. and the Waterfront Promenade. The Iowa and Crafted at the Port of Los Angeles (which opened on 06/29/2012) are now the newest additions to Angels Walk LA (the San Pedro walk starts under the shadow of the Vincent Thomas and ends at the Cabrillo Beach fishing pier) and southbound traffic on Harbor Blvd. now drops 10-20 mph as soon as the Iowa comes in view. 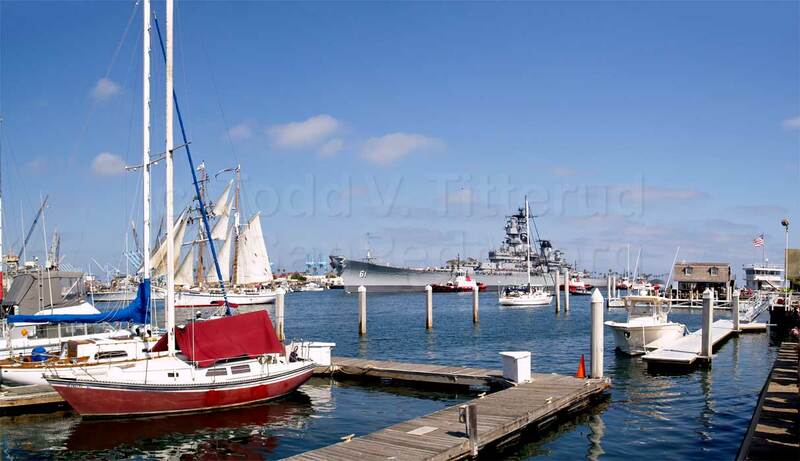 Additional panoramic images of the USS Iowa from the above San Pedro locations are available in the following photo album on Picasa. The Iowa can also be viewed as part of the harbor “landscape” seen through the Fireboat No. 2 viewing windows at Fire Station 112.